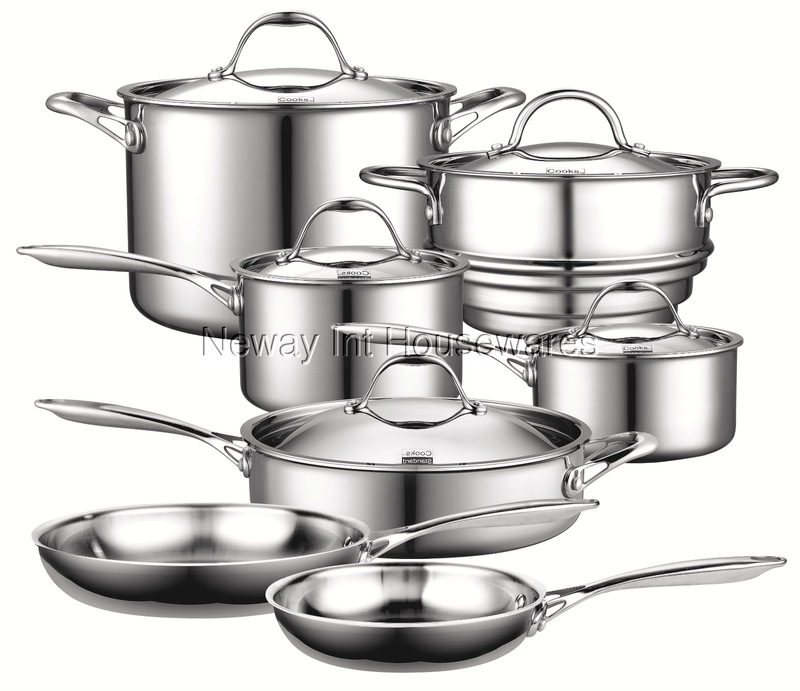 The Cooks Standard 12-Piece Multi-Ply Clad Stainless Steel Cookware Set includes: 1.5 and 3 quart sauce pans with lids, steamer insert with lid (fits 1.5 and 3 quart sauce pans), 8 quart stockpot with lid, 8 and 10-inch fry pans, and an 11-inch/5 qt saute pan with lid. Multi-ply construction has 2 layers of stainless steel and an aluminum core along base and walls. Stainless steel lids keeps heat and moisture in. Riveted handles stay cool with air-flow technology. Induction compatible. Works on gas, electric, glass, ceramic, halogen, etc. Oven safe to 500F. Dishwasher safe. Induction compatible. Oven safe to 500F. Dishwasher safe.